Cambridge Gage (Prunus domestica 'Cambridge') is a delightful small, yellow-green gage. It is popular because of its deliciously juicy fruit. 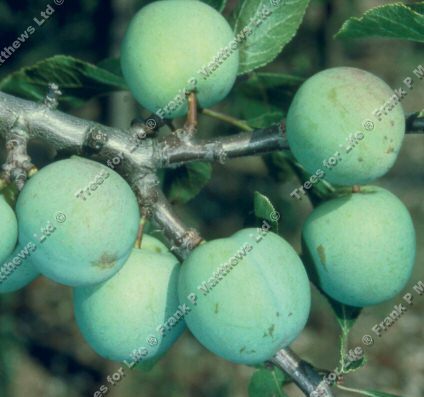 It produces reliable crops and is self-fertile, therefore no need for a pollination partner and will produce fruit without the need for another Gage tree neaby. It prefers a sheltered, warm, sunny position. Cambridge will cross pollinate with plums. This gage is in flowering period is C3 so if you have another gage tree that is not self-fertile, it will pollinate it so long as it is in flowering groups C2,C3 or C4. All our containerised Gage fruit trees (those that come in pots) can be planted ALL YEAR ROUND (except in frost) but do not leave them outside in their containers over winter (October to March) as it may kill the Gage Tree. If you want to keep them in the their pot or container, during winter move them to a heated conservatory or greenhouse. A Gage tree rootstock is made up of several parts. 7L, 10.5L or 12L refers to the size of the pot it is delivered in, given in litres. These trees are at least 2 years old. Bush and Half Standard refers to the shape. A Gage bush will have branches coming out from the bottom or near the bottom of the tree whereas a Half Standard has had most of them trimmed off to give it more of a tree shape, a bit like a lillipop. St Julien A or Pixy is the mature height of the tree. St Julien A is 3.6 metres approximately and Pixy is 3.0 metres. Bare Root. These are cheaper than containerised trees as they come without the earth and pot around the roots. Only available from November through to March.